After testing several kinds of equipment and getting acquainted with the stripe projection method supplied by Breuckmann GmbH, we were ready to have a first test run with a real Rodin sculpture. Following up our correspondence with the Musée d´art moderne et contemporain in Strasbourg, the first Museum visit took place in this city, within four hours driving time from Breuckmann's facilities in Meersburg. 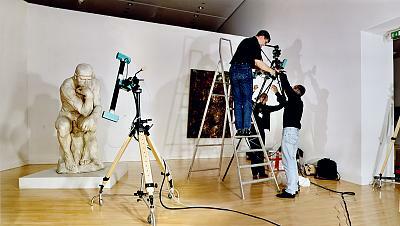 On Sunday, 22 September 2002, after the Museum had closed for the public, our team, together with Mr und Ms Breuckmann and Mr Tyborski, and with the friendly support of Museum staff, installed topometric and conventional cameras in the large room where Rodin's Thinker is displayed. After 90 minutes, our set-up was complete, so that we could start with the actual survey early Monday morning. For measuring spatial qualities, we used 3 different optoTOP sensors, covering areas with a diagonal spread of 180, 60 und 20 cm respectively. 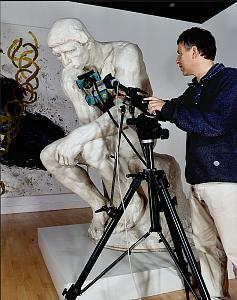 With the largest sensor, we were able to grasp the total structure of the sculpture within ca. 2 hours. Another 5 hours were needed to make additional scans of smaller patches, this time in higher resolutions. Especially the face, the hands and the feet needed extra attention, in order to document the finer details of the modelling. Every single scan supplied us with geometrical data of 1.3 Mio points in space. All patches were aligned to the total model immediately after shooting, using powerful PolyWorks software. Because the sculpture offers enough surface variation, it was not neccessary to use extra measuring marks, that might have sticked to the plaster. Finally, we used the evening hours to make stereo color photos from different angles. At the end of the day, we had produced over 90 different 3D scans of various segments of the sculpture, and over 100 color photographs.